People with serious mental illness (SMI) are more likely to experience severe health conditions, such as cardiovascular disease, respiratory disease and stroke, and are likely to die earlier, than the general population. 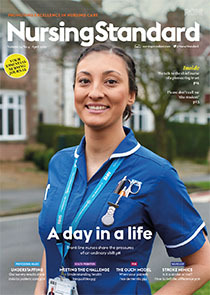 This article explores the reasons for such disparities, using a case study approach to outline the ways that general nurses can support people with SMI when they access general healthcare services. It identifies five areas of learning from the case study: diagnostic overshadowing and stigma; developing the therapeutic relationship; the ward environment; inclusion of family members and carers; and integration of physical and mental health services.